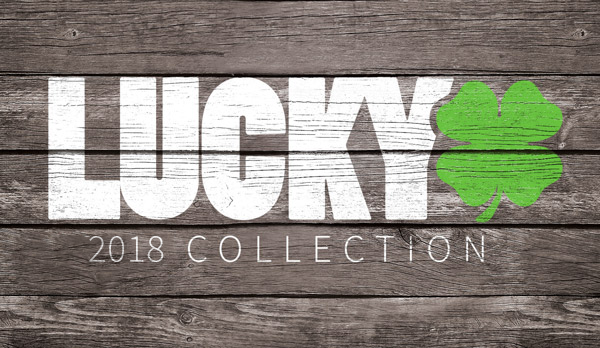 Lucky Scooters has probably the best online pro scooter builder in the industry. With the options and combinations available It is a ton of fun to play with. It's almost never ending fun.... Just to let you know custom scooters arrive to you fully assembled. All you have to do is attach the bar to the deck. Even though it is a ton of fun to play with, we do receive quite a few questions asking about what bar height and width to get on a custom scooter, the choices can become overwhelming... Unfortunately that can be a hard question to answer. Each rider from beginner to pro is different. They will have different styles and different needs. What we are going to do here is show you how we measure the bar sizing when we build a scooter. We are going to start with introducing you to the types of scooter compression systems we use. They are HIC and SCS. HIC stands for Hidden Internal Compression. This means that there is a shim installed over the fork, and the bar slides over that shim into place. In this set up there is a small slit cut into the bar. This allows the bar to compress around the shim when the clamp is tightened. In this set up when we build the scooter for you we measure out the entire length of the bar and cut it to your specs. You can see the image below. Usually, from the bottom of the wheel to the top if the headset is about 10" inches. This is the same for 100MM and 110MM wheels. When considering the HIC set up, when you pick a bar height (blue arrow on the image above), it will be that tall. 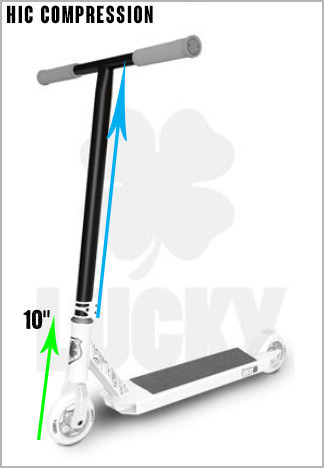 This means that if you choose a 23" tall by 22" wide bar, the overall riding height of the bar will be 23" tall plus the height of the scooter. HIC compression is used with our Double, Triple and X-Clamps. 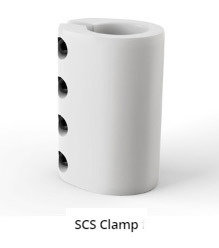 SCS stands for Standard Compression System. In this set up there is no shim, instead we install the clamp directly onto the fork. Then you install the bar into the SCS clamp. When you tighten the clamp everything is held in place. SCS is different than HIC is another ways. There is no slit on the bar. This allows the clamp to snuggly fit around the bar. You can see the image below. Just likekin HIC, from the bottom of the wheel to the top if the headset is about 10" inches. This is the same for 100MM and 110MM wheels, even with SCS. Another difference is that since you are bolting the clamp directly onto the fork, you are raising the height by 2” inches. That is the part that is interesting. You have to take those two inches into account for your overall riding height. If you want an overall bar riding height of 23” inches, you will need to select a 21” inch bar height (blue arrow on the above image) . We will cut the bar at the height specified on your order, just like HIC compression. 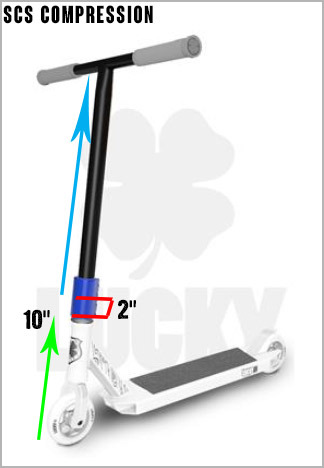 We hope this helps with figuring out the bar height for your custom scooter purchase. If you are also trying to figure out bar width, consider this. Measure your shoulder widh to figure this number out. That seems to be the average for most riders. Most importantly remember to take into account the ride height when making your purchase. For HIC the ride height will not change, for SCS you have to remember the extra 2" height . Also take a look at our already pre built completes for their bar heights and widths as examples. Their measurements are based on customer feedback. We also wanted to remind you that the custom scooters arrive to you fully assembled. All you have to do is attach the bar to the deck.